Darwash (Dhara Wala), Eastern Bengal. bl.uk > Online Gallery Home	> Online exhibitions	> Asia, Pacific and Africa Collections	> Darwash (Dhara Wala), Eastern Bengal. 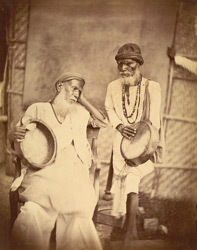 Portrait of two male figures, one seated in a European chair, the other standing; both are holding tambourine-like instruments. This print is from a collection of portrait studies of individuals and groups from Eastern Bengal (modern Bangladesh and Assam). They were taken in or around a temporary studio constructed from wicker panels with an open roof to admit light onto the subject. A hand and arm can be seen in the background holding a plain photographic backdrop in place.